December 28, 2017 (London, ONT) — Today, LondonOntarioSports.com announces that nominations are now open for the 2018 Jeffrey Reed Courage Award. The Jeffrey Reed Courage Award (est. October 2015) is an annual award given to a Southwestern Ontario athlete – amateur or professional – who inspires others by demonstrating courage on and off the playing field. On July 25, 2001, Jeffrey Reed achieved what many thought was impossible. Despite his numerous physical disabilities, and at age 39, he pitched as a rookie for the London Majors of the Intercounty Baseball League. His story, Diamond Dream: Jeffrey Reed’s Inspirational Story of Hope and Determination, recounts his life story, both as an athlete and as an award-winning freelance journalist. Visit http://www.jeffreyreedreporting.com/speaking.htm. An underdog, Jeffrey Reed beat the odds, both as an elite athlete, and as an entrepreneur in the competitive industry of journalism. Now, through the Jeffrey Reed Courage Award, countless others can share their own inspirational stories with a large audience, while at the same time being awarded for their efforts. This is what the Jeffrey Reed Courage Award is all about: recognizing courageous athletes who beat the odds, and allowing them to inspire others to dream of greatness and achieve their goals. 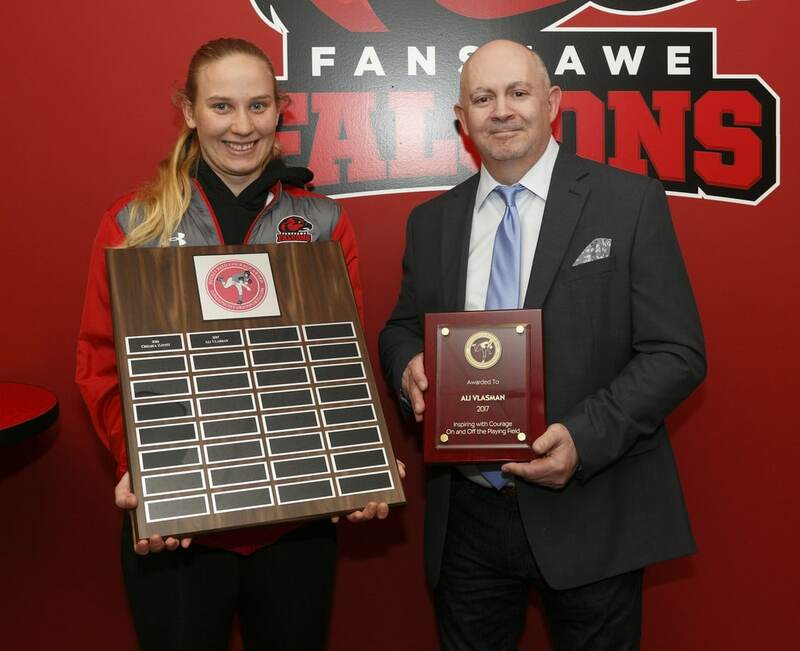 In 2017, Fanshawe Falcons women’s basketball and soccer standout Ali Vlasman of Mount Elgin, Ontario captured the Jeffrey Reed Courage Award. The road to being named Fanshawe Falcons’ female athlete of the year in 2016-17 was not an easy one for Vlasman. She was involved in a tragic automobile accident in 2013, and also lives with ADHD and dyslexia. But she has never quit fighting, and, with support from multiple mentors, Vlasman is excelling on the hardcourt, on the pitch and in the classroom at Fanshawe College. 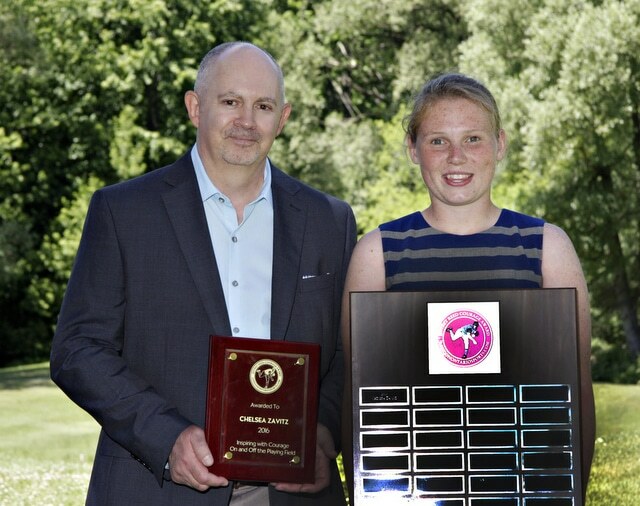 Soccer star Chelsea Zavitz of St. Thomas, Ontario was the inaugural winner of the Jeffrey Reed Courage Award in 2016. A member of the League1 Ontario champion FC London women’s soccer squad, and Vlasman’s teammate on the Falcons women’s soccer team, Zavitz has suffered multiple concussions, including a devastating head injury in 2014. Like Vlasman, she, too, mentors other student athletes. This school year, Zavitz was named an OCAA women’s soccer all-star. Each June, one Southwestern Ontario athlete will be awarded the Jeffrey Reed Courage Award. LondonOntarioSports.com will award this athlete with a $1,000 cheque, as well as a plaque at an annual banquet recognizing and celebrating his or her courage in sports and in life. Each athlete will nominate themselves through the following process, then submit their application to: The Jeffrey Reed Courage Award at news@londonontariosports.com. Nominations close at 12 midnight on March 31, 2018. 1. Write a 1,000-word essay on your achievements on and off the playing field, citing your challenges, how you tackled them, how you achieved your goals, and how you inspired others. Include how the remuneration attached to the award would help you in your future endeavours. 2. Submit links to news stories and/or videos chronicling your achievements (if applicable). 3. Submit at least one high-resolution photograph in your team uniform i.e. hockey, ringette, etc. or athletic gear i.e. golf, running, etc. 4. Include three references i.e. coaches, mentors, teachers – please include first and last names, e-mails and phone numbers. 5. Include with your submission your: first and last name; date of birth; full address; e-mail address; and phone number. 6. Email all of your material to news@londonontariosports.com . DISCLAIMER: Only the winning nominee will be contacted by LondonOntarioSports.com. By submitting your nomination, the winner grants LondonOntarioSports.com, all of its social media platforms including Facebook, Twitter, YouTube, Instagram and LinkedIN, and its marketing and promotions material – online, print and broadcast media – permission to use your story when promoting the Jeffrey Reed Courage Award. All other nomination material will be kept confidential and on file for future reference, if a nominee applies during subsequent years. All personal information – including essay content, home address/residence, e-mail address, phone number and date of birth – will be kept confidential and will not be used for any purpose. Thank you to our Jeffrey Reed Courage Award 2017 Major Sponsors and Partners: M&T Printing; Highland Country Club; Wilson Golf; Cobra Golf; Heart & Stroke; and Kevin Gardner, State Farm Insurance. Read more about our 2016 and 2017 Jeffrey Reed Courage Award winners at https://londonontariosports.com/category/community/jeffrey-reed-courage-award/.